The Not So Professional Beer Blog: Review: Redbridge, Anheuser-Busch, Inc. Ingredients: Water, fermented sorghum (sorghum, corn syrup), hops, yeast. Calories: 127 per 12 oz. Description: "Redbridge beer doesn’t need to make promises to stand outfrom the crowd; its very essence sets it apart. Redbridge is made without wheat qor barley, so the approximately 3.2 million consumers who are unable to drink beer made with barley due to Celiac Disease or because they follow a wheat-free or gluten-free diet can once again enjoy a great tasting beer. 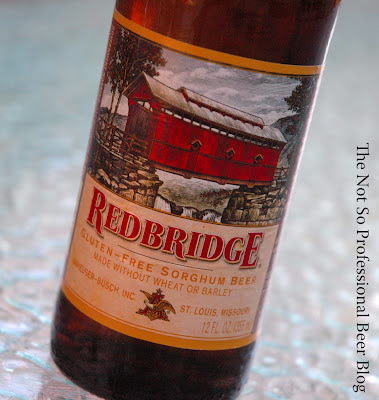 Redbridge is a rich, full-bodied lager brewed from sorghum for a well-balanced, moderately hopped taste." — Anheuser-Busch, Inc.
Random thoughts: I'm drinking this as part of my series on Gluten-free beer. I've profiled many different styles of beer, and to be honest, I'm not excited about tasting these. However, because the Mayor of Portland decreed yesterday to be Gluten-free Beer Day, I thought I'd drink this in a show of solidarity for the gluten intolerant. The tasting: Amber in color, clear, with a white head that dissipated very quickly. Aroma of bread, cereal, yeast, and spicy hops. Not bad, actually. Flavor of—so that's what sorghum tastes like! This will be a challenge to describe, but I'll give it my best shot. It starts with a cereal-like flavor along with a mild sweetness. Some grassy hops are present in the middle along with mild tartness that becomes more dominant once the beer warms up. 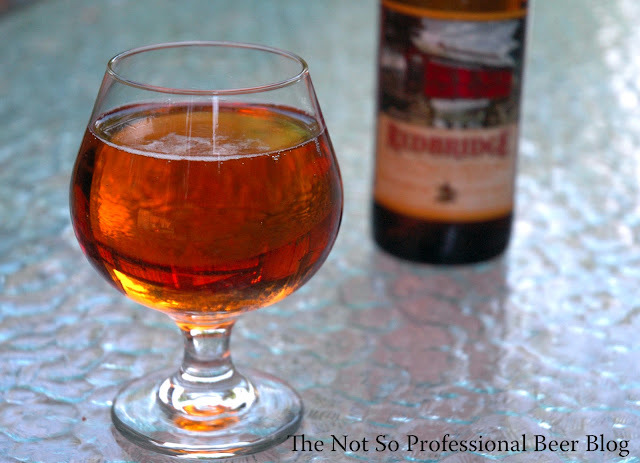 Redbridge is light bodied, softy carbonated, and has a flat mouth feel. Overall hop bitterness is low and it finishes with light grassy hops and lingering cereal. Rating: 2 star. Drinkable—but not sure I want to. There is a reason beer should be made with barley or wheat. The sorghum gives it a strange off-putting flavor that is hard to describe. My tasting notes do not adequately describe the sensory experience. Rating (if I was Celiac): 2 star. Drinkable—but not sure I want to. First of all, I commend Anheuser-Busch for developing and broadly distributing a gluten-free beer. While I don't mean to diminish the plight of Celiacs, if this is their only gluten-free beer option, wine and hard cider are superior alternatives. So if I was Celiac, I'd pass on this one. Have you tasted Redbridge? What do you think? A much better Gluten Free is Green's Amber Ale (Belgium) ... but it's 'xpensive.